The DFI LANParty UT nF4 Ultra-D, like other members of DFI's vaunted LANParty series motherboards, was built for the ultimate gamers and overclockers. While most manufacturers provide opportunities for tweaking options, there are few that really cater their option set to allow serious changes by the aggressive end user. This board is going to make serious waves. The board's layout makes connections a snap, and it's easy to find all the sockets and connectors for ease of installation and modification. Powered by NVIDIA's acclaimed nForce4 Ultra chipset and featuring support for AMD's powerful lineup of Socket 939 processors and DDR400 dual channel memory, DFI's peerless workmanship ensures that this glow-in-the-blacklight, exceedingly modifiable motherboard has the top-class stability and extreme overclockability for the raw power desired by today's gamers. Tweaking is made simple with the extensive BIOS setting options. Other advanced features include 4 SATA connectors with RAID support, 8-channel onboard audio, dual Gigabyte LAN ports and FireWire IEEE1394a support. NVIDIA nForce4 Ultra Chipset The NVIDIA nForce4 Ultra media and communications processor (MCP) delivers unbelievable PC performance with PCI Express graphics support and cutting-edge features including SATA with RAID support and NVIDIA Gigabit Ethernet with TCP/IP acceleration and NV firewall. The NVIDIA nForce4 Ultra chipset ensures maximum PC performance with future-proofing features for the demands of tomorrow. DXG (Dual Xpress Graphics) Support DXG provides freedom and flexibility with the utilization of the PCIe interface. With the extra PCI Express x16 slot, an additional PCIe graphics card can be installed for a dual VGA solution in a single motherboard. Excellent Build Quality and Board Layout The DFI LANParty UT nF4 Ultra-D is built to perfection with high quality UV reactive slots and a magnetic-levitate chipset heatsink fan. DFI features a board layout with unique DIMM slot positioning to promote and release air flow for cooler running components. 100% Japanese-made Capacitors and 3-Phase PWM A 3-phase PWM design for processor VRM (voltage regulator module) enhances system stability and reliability under heavy-loading and overclocking. The heatsinks attached to the MOSFETs ensure temperatures to stay comfortably cool even under full loads. All capacitors are 100% Japanese-made for the highest quality. Karajan Module with 8-Channel Onboard Audio 8-channel audio support and coaxial S/PDIF in/out interfaces are joined by the isolated onboard audio Codec on the Karajan audio module for enhanced signal-to-noise performance and amazing sounding audio. Extensive BIOS Options and CMOS Reloaded DFI’s enthusiast-friendly BIOS allows fine-tuning of the motherboard through extensive BIOS tweaking options, such as memory timings and voltage levels. CMOS Reloaded enables the saving, renaming and recalling of different BIOS settings for easier tweaking and overclocking. Pros: That's board is great. If you are looking for something versatile and lots of options this is for you. Cons: None that are realle big, just placement of motherboard fan and RAM slots. Power Consumption. Other Thoughts: I have an Athlon 64 3700+, 1 gig RAM, two hard drive IDE, two CD-burners IDE, and a SATA DVD-Burner. I also run WIndows Pro 64 and this thing flys. Have a larger Modular Power supply from Hiper which made things a lot easier for installation and making everything look good. Pros: Good board. works great with my parts. Had little problems with it. Cons: There is only ONE issue with this board. IF U HAVE A BIG VIDEO CARD AVOID THIS MOTHERBOARD! My X1950XTX card blocks out the onboard fan in the PCI Express slot 1. I had to keep it a bit loose for the fan to spin. It may increase temp in pc. Pros: Great board for any OS other than Vista x64, not sure about the x86 version. Other Thoughts: Wouldn't purchase this board again If i Had known about these issues, The manufacturer gives no support on bios updates. BUY ASUS! Pros: awesome layout, awesome overclocking, awesome performance, just plain awesome. this board hits well over a 300mhz fsb without much effort and perfectly solid once tweaked. 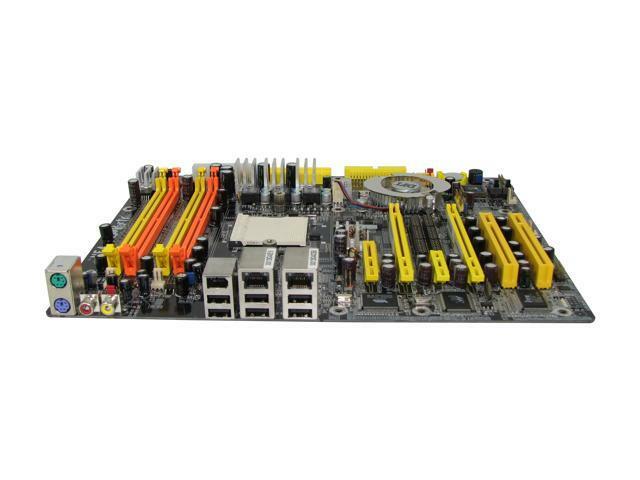 Other Thoughts: best motherboard for skt 939. Pros: The board powers up, recognizes my processor and HD and will load windows. Cons: the heat from my two 7800 gtx's BURNED the chipset fan. Take a look at where the chipset is located, and if you have a extended graphics card (most high end cards do) then DO NOT BUY THIS BOARD. If you have a short Video card, then go for it its great, but I am just going to buy a new board for my setup. Pros: I bought this mobo for my first build 6 months ago and have had no problems since. The Bios is amazing! Other Thoughts: This board is an excellent buy for the money, and the fact it can easily be modded to support sli and raid is just icing on the cake. Pros: Having the record for the most bug's and porblems. Cons: I couldn't ship it back fast enough! Other Thoughts: Don't print SLI support on the board if it does'nt have it..DFI thumbs down on everything!